25, 24, 23.each year, kids of all ages can’t wait until Christmas. So, a countdown clock is perfect to let everyone in your family know exactly how many days, hours and even seconds there are until the big holiday. The digital clock with Santa Claus ready to race down the slopes on candy cane skis requires two (2) AAA batteries (not included). Festive and collectible, Hallmark Keepsake Ornaments come ready to give in a seasonal holiday gift box. The box can also be used for ornament storage. Set the clock to count down the days, hours, minutes, and seconds until Christmas. Features light. This Hallmark Keepsake Ornament measures 3.7 x 4.6 x 2.1 inches and comes in a 4 x 5 x 2.9 gift box. Magic Light Ornament is made of plastic and features a digital countdown clock (batteries not included). Designed by Jake Angell. Each piece includes one 2017 Santa Skiing Countdown to Christmas Clock Christmas Ornament With Light in a gift-ready box. From preserving precious memories to commemorating special milestones, there’s a Keepsake Ornament for everyone on your list. Hallmark has been your family-owned creator of greeting cards, gifts, gift wrap and more for over 100 years. We take deep pride in helping individuals connect in just the right way. This Hallmark original Keepsake Ornament features unparalleled artistry and exceptional detail. The ornament is lead-free and made for years of celebrations. This Christmas tree ornament digital countdown clock lets kids know exactly how many days, hours, minutes and seconds there are until Santa comes down from the North Pole. Two AAA batteries required (not included). Set the clock to count down the days, hours, minutes, and seconds until Christmas. Features light. This Hallmark Keepsake Ornament measures 3.7 x 4.6 x 2.1 inches and comes in a 4 x 5 x 2.9 gift box. Magic Light Ornament is made of plastic and features a digital countdown clock (batteries not included). Designed by Jake Angell. 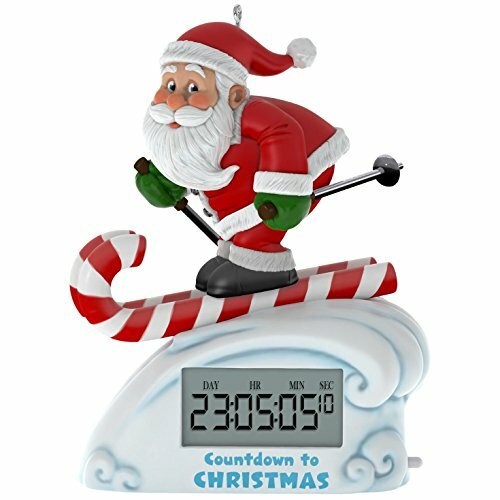 Each piece includes one 2017 Santa Skiing Countdown to Christmas Clock Christmas Ornament With Light in a gift-ready box.